One of the key products which specifically aims its benefits towards men and testosterone support. Those looking for a more all-rounder type of product may want to look for something which is less aimed towards building muscle, etc. Younger men will find this product works fantastically well to give energy, overall vitality, and help in the gym with building muscle mass. This product is packed with vitamins and minerals for men’s health and is particularly aimed at providing natural testosterone support, including two of the most important vitamins and minerals for that function – Boron and Tribulus. On top of this, the multivitamin gives you the usual host of immune function benefits, with antioxidants aplenty. Many athletes find benefit with this product, as it gives all the nutrients needed for optimum performance and overall health. You can take the tablet either with a meal or without, it makes no difference to how it works, but it is quite gentle on the stomach too, which is great for anyone who does have a gastric sensitivity, for example. 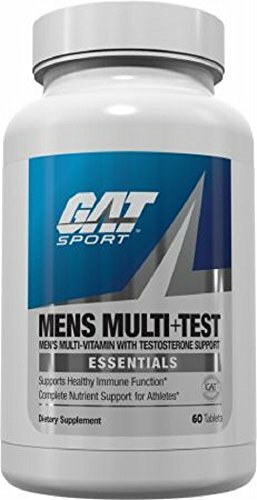 Put simply, this multivitamin is ideal for anyone who is working hard in the gym and wants to build muscle mass, and also to support the male testosterone supply, to give overall male vitality and an energy boost too.